With an exceedingly interesting cost-benefit ratio, pneumatic treatment units offer a real alternative to micro motor operated treatment systems. Since the so-called pneumatic or compressed air unit is not driven by an electric/micro motor, but rather with compressed air, these systems are almost maintenance-free and stand out thanks to their extremely low operating costs. The compressed air treatment unit does not require a separate power connection since all functions are driven by means of air compressed air. The inlet hose between the treatment unit and compressor is available in lengths up to 20 metres at SÜDA so that the compressor can also be placed in a separate room. This is especially advantageous in small cubicles. The compressed air-operated treatment unit, the podoAIRspeed, opens up new dimensions in compressed air-operated treatment technology, both with its technical components, working ergonomics and efficiency, as well as its functionality and design. 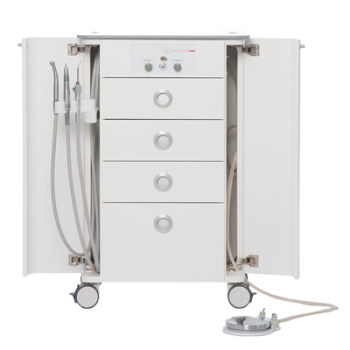 With its extremely reasonable price-performance ratio, it also offers small chiropody practices a real alternative to micro motor operated extraction/wet technology systems. Air motor with spray hand piece and turbine: The compressed air unit’s treatment functions enable treatment via a comfortable foot switch whilst working, so that you can work with focus, precision and high-efficiency.